I can't believe February is nearly over. Time sure flies when you've got 15 projects going at once. After getting all my plants set up on the work bench in the garage, I realized they still weren't warm enough, even on the warming mat. 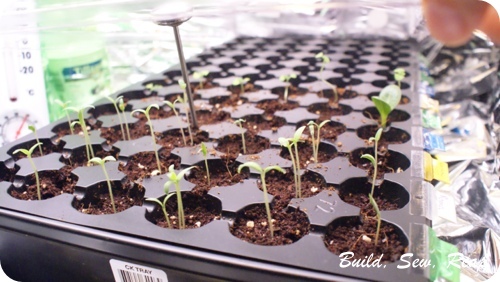 I knew I had to warm up the air around them in order for the warming mat to get the soil warm enough (it claims to warm the soil 10-15 degrees above air temperature). I ended up laying down a mylar emergency blanket on the work bench then put the warming mat and all the plants on it and then I built a structure out of pvc pipe and covered it in mylar blankets. I added a work light to the inside and another warm light shining from the outside and the temperature inside my little greenhouse rose to a comfy 75 degrees where the plants obviously were very happy. over the hot house as well as the soda bottle greenhouses. 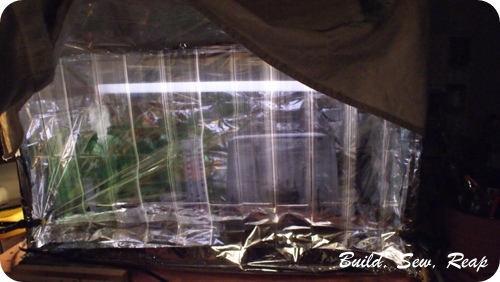 Once the seedlings are stronger and I can peel back the mylar blankets a bit, I'll do a post on how I created the larger structure. I was in a hurry to get it built though so I didn't take pictures along the way. The next order of business is to tell you to go make these AMAZING cookies right now!! From the Post Punk Kitchen, it's Mexican Hot Chocolate Snickerdoodles. I didn't have enough canola oil so I substituted in coconut oil. Coconut oil gets really thin when it is warmed so I will say that my cookies weren't as thick as hers and got a bit crispy but the taste was to die for. I can imagine that following the recipe exactly as she writes it would be wonderful. You would never know these are vegan, they're rich and delicious (you'd think they were full of butter). If you follow BSR on Facebook, you might have seen my note that Home Depot had their 8 oz paint samples on buy one get one free sale through their website. This offer included free shipping so I ordered 16 little pots of indoor/outdoor paint samples. They arrived this week and I'm already thinking of all the paint projects I can do with so many colors. 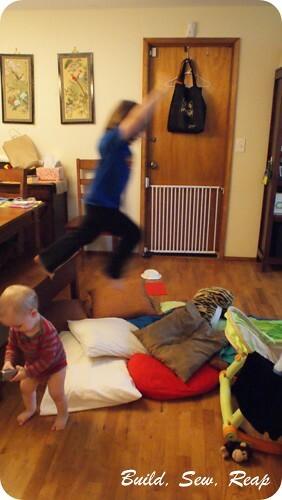 The Snickerdoodle invented a dangerous but very rewarding game. 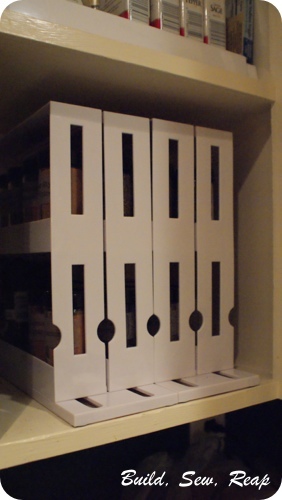 I also reorganized my spice cabinet. 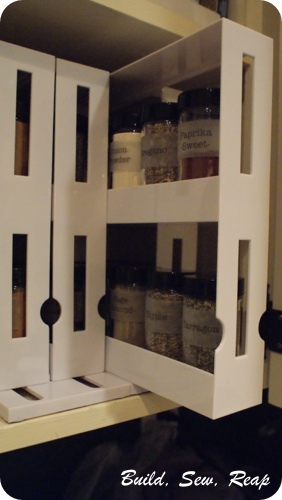 I found these great swivel spice racks on Groupon goods a couple of weeks ago (offer is gone now but apparently they have them on closeout at Big Lots) and then purchased a boat load of new spice jars from Bed Bath and Beyond. On that note, did you know that you can use stacks of their coupons in one transaction AND they can be expired? I was surprised to find I could even use two $5 off $15 coupons in one transaction as long as my total equaled $30+. I picked up 32 new spice jars for around $24 after taxes. I made labels for the jars and was really happy with how they turned out. 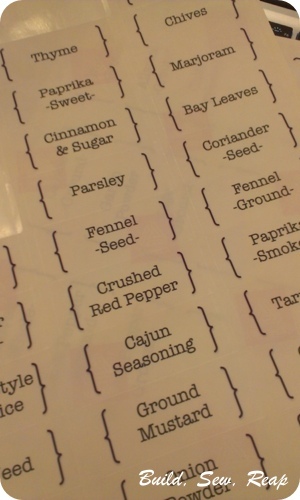 I created them in MS Word but because it was fighting me with the bracket graphics, I just created one file of brackets and one with the spice names and sent the clear address labels through twice. I thought about using one of the other printouts available online but knew I had some spices others might not and wanted to make sure I could create my own custom labels easily. And the last thing to report - and this is the big news of the week: We're getting chickens!! While I would love for the whole family to eat vegan, the Snickerdoodle and the hubs are both hooked on eggs. The best way I can figure to get around the problem I have with supporting the egg industry is to get our own chickens. 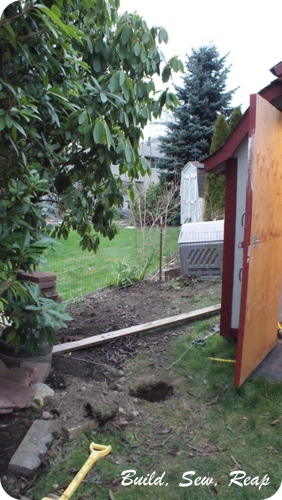 We are going to convert the back half of the old shed into a coop with nesting boxes and then are fencing and roofing an area just beside the shed so they'll have a safe place to peck and scratch around outside. We also plan to let them free range throughout the yard when we're around to supervise them (at least until we get to know them better and feel comfortable they won't wander off and the neighborhood critters won't hurt them). Here's Super Snickerdoodle showing off the freshly cleaned out shed. 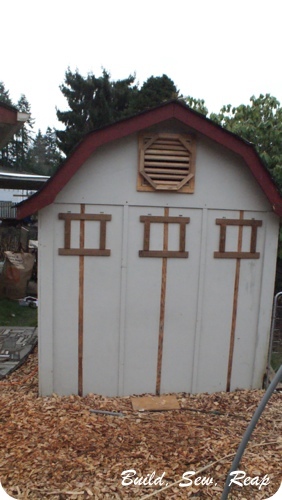 I added the top vent as well as three windows opposite the dutch door so we can open things up in the summer and get a nice breeze moving through the coop. The brown vertical lines are where I pulled some trim off. 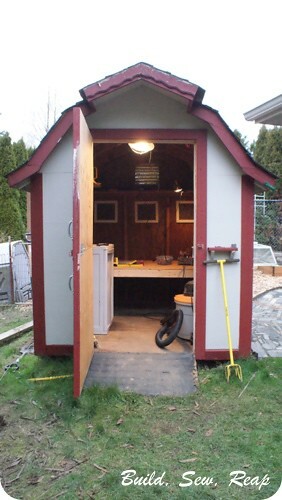 I haven't decided if I'm going to put it back on or just paint the stripes to match the rest of the shed but I'll decide after I install the nesting box which will hang below the windows. 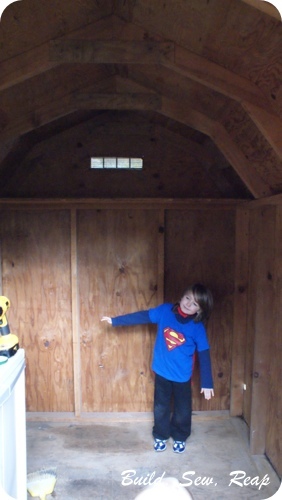 We're building a platform inside the shed so we can continue to store smaller items like buckets and hoses under the coop. The chickens will be contained in the upper portion of the 4x6 area. There will be a door and wall made of chicken wire. The hubs started clearing the yard for the chicken run. We will frame it out and add chicken wire walls as well as a corrugated roof. This will give them a space that's safe from predators. Well, I think that's about everything to report. I've already got some posts planned out for this week so stay tuned! I would love Chickens! But. I am 99% sure our city code forbids it. Sigh.